Posted on 7/31/2018 by Benjamin Heyworth. 0 Comments. 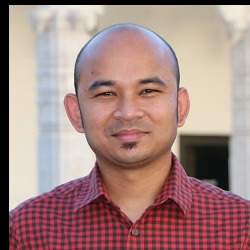 We interviewed Raju Shrestha, who is currently one of our top SAP instructors. He combines more than a decade of industry experience, with thoughtful instructional design and training methods to produce the highly successful Introduction to SAP OData Services, Introduction to ABAP 7.4 for HANA, and Debugging ABAP for SAP Functional Teams courses. MMC - Raju, thank you for agreeing to share your knowledge, and words of encouragement to SAP professionals around-the-world, who are contemplating teaching for Michael Management! Please introduce yourself and share a little bit about your background and journey in SAP. Raju – Thank you for giving me this wonderful opportunity to share my story. My name is Raju Shrestha and I have been working in SAP since the Summer of 2006. I was trained and groomed at IBM and was lucky to have wonderful team leads and team members who taught me the fundamentals of SAP ABAP programming. Since that time, I have worked for automation, heavy machinery, pharma, and energy sector clients. 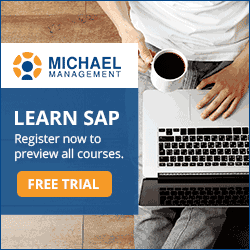 MMC – Tell us more about the SAP courses you teach for Michael Management? Raju - I have been an ABAP programmer for more than a decade, so my comfort zone is SAP ABAP. I have released 3 courses: Introduction to SAP OData Services, which is targeted to ABAP developers, Introduction to SAP ABAP 7.4 for HANA – which is broken into three parts, the first two are useful (even to Managers and C-levels) because it shows the journey of SAP from R/3 to S/4HANA and why BW was introduced, and the third part answers why S/4HANA is important. My third course is Debugging ABAP for SAP Functional Teams. I was inspired to create this course by a non-technical team member on one of my projects who wanted to learn the basics of ABAP debugging. This course is targeted for Functional Team members, but ABAPers will equally benefit from it. MMC - Students are enrolling in your courses and completing lessons. Your efforts have certainly paid off! What originally inspired you to start teaching SAP? Why do you so now? Raju - I am glad that students are enrolling and investing their valuable time in completing lessons. Nothing is more satisfying to me than learning that my efforts in preparing these courses are appreciated and useful to my students. I have been sharing tips and tricks which I learned at work and various projects at a popular sharing portal sapyard.com which I floated. I enjoy preparing easy to understand documents and tutorials. When a good friend introduced me to the MMC portal, I told myself “This is what I am looking for”. I did not want my effort and courses to be lost in the vastness of the internet. I wanted my courses to target and reach the maximum number of students and MMC provided me the platform I needed. MMC - When teaching SAP – what is your unique teaching approach and teaching philosophy? What is the best way to learn it? Raju - I believe in the principle of KISS – Keep It Super Simple. I teach the theory and immediately after I show them the theory in action, in an SAP system. I read that the attention span of healthy adults ranges from 10 to 20 minutes. The reality is their attention span might be less. Instructors need to do their best to keep their courses crisp and interesting. This way students can come back where they left off in their courses and regain their attention and focus. My philosophy is to teach the basics. By teaching my students to walk, they will learn to run. I do not believe in bombarding or overwhelming my students with information they might not understand or need for projects. We shouldn’t be afraid of the unknown. The best way to learn is by making and correcting mistakes. If you want to learn SAP, go to your SAP sandbox and start configuring, programming and testing. Even if you feel you learned nothing from this, you will learn what not to do next time. MMC - What sets you as an instructor (and your course materials) apart from the rest? Raju - This question should go to my students. They would be able to answer you better. If you ask me, I try to tell stories in my courses. I take an unorthodox approach when presenting and I try to make each video interesting. There are always moving parts in my videos and my students have something new to watch and listen to every minute. MMC - What is your “secret recipe for success”? What advice do you have for other instructors striving to achieve similar success? Raju - I don’t have a secret recipe for success. I have created only 3 courses, so it might be beginner’s luck. It might be too early for me to provide any concrete advice to other instructors. If I consistently perform this way in 12 months, I should have some advice ready. One thing that has worked for me is the simplicity of my courses. I lay the foundation of my course with concepts and theories which are short and to-the-point. My explanations are my own, and they come from my understanding of the concepts, not from any books or tutorials. My course: Introduction to ABAP7.4 in S/4HANA was taken by non-technical consultants and many were kind enough to leave genuine feedback. Some said that there was background noise and it should have been re-recorded, some said that I spoke a little fast, and some said I was difficult to understand with my non-native English accent. Even with those gaps, they still gave 5-star ratings. Word-of-mouth marketing still works in the digital world and video content is the king. I was successful in conveying my thoughts and in return they invested their valuable time to listen to me. It was a win-win for both of us. MMC - What parting words of advice or encouragement can you give to new and prospective instructors? Raju - You need to love your videos before you share them. Watch them end-to-end more than once. If you don’t like something, your students may feel the same. Re-record your lessons if you need to. When recording, try not to sound tired. Prepare your videos when you are in a good mood. Instructors should sound loud and clear while also trying to connect with their students in a conversational (someone is talking directly to them) way. Finally, tell stories in your courses. Learn more about Raju Shrestha's story. Do you have a desire to share your SAP knowledge with an engaged community of learners? If you’re ready for the next step, we want to hear from you! Apply to Become an Instructor. I am the guy behind the scenes and in front of the crowd. I blend the magic of digital marketing and showmanship to create and invite the world to memorable, and immersive SAP learning experiences - they will love. You will see me in our emails, our website, social media, and just maybe... some less-than-obvious, but still important, techie stuff.